For other uses, see Stromness (disambiguation). Stromness locally /ˈstrʌmnɪs/ is the second-most populous town in Orkney, Scotland. 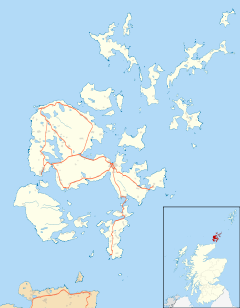 It is in the southwestern part of Mainland Orkney. It is also a parish, with the town of Stromness as its capital. The name "Stromness" comes from the Norse Straumsnes. Straum refers to the strong tides that rip past the Point of Ness through Hoy Sound to the south of the town. Nes means "headland". Stromness thus means "headland protruding into the tidal stream". In Viking times the anchorage where Stromness now stands was called Hamnavoe, meaning "peaceful" or "safe harbour". A long-established seaport, Stromness has a population of approximately 2,190 residents. The old town is clustered along the characterful and winding main street, flanked with houses and shops built from local stone, with narrow lanes and alleys branching off it. There is a ferry link from Stromness to Scrabster on the north coast of mainland Scotland. First recorded as the site of an inn in the sixteenth century, Stromness became important during the late-seventeenth century, when Great Britain was at war with France and shipping was forced to avoid the English Channel. Ships of the Hudson's Bay Company were regular visitors, as were whaling fleets. Large numbers of Orkneymen, many of whom came from the Stromness area, served as traders, explorers and seamen for both. Captain Cook's ships, Discovery and Resolution, called at the town in 1780 on their return voyage from the Hawaiian Islands, where Captain Cook had been killed. Stromness Museum reflects these aspects of the town's history (displaying for example important collections of whaling relics, and Inuit artefacts brought back as souvenirs by local men from Greenland and Arctic Canada). An unusual aspect of the town's character is the large number of buildings decorated with displays of whale bones outside them. At Stromness Pierhead is a commemorative statue by North Ronaldsay sculptor Ian Scott, unveiled in 2013, of John Rae standing erect, with an inscription describing him as "the discoverer of the final link in the first navigable Northwest Passage". The parish of Stromness includes the islands of Hoy and Graemsay in addition to a tract of land about 5 miles by 3¾ on Mainland Orkney. The Mainland part is bounded on the west by the Atlantic Ocean, on the south and southeast by Hoy Sound, and on the northeast by the Loch of Stenness. Antiquities include Breckness House, erected in 1633 by George Graham, Bishop of Orkney, at the west entrance of Hoy Sound; and an ancient cemetery, with a ruined church, and the remains of a monastery, between Breckness House and Stromness town. The Stromness branch of the Orkney library is housed in a building gifted to the library service in 1905 by Marjory Skea (later Corrigall). Writer George Mackay Brown was born and lived most of his life in the town, and is buried in the town's cemetery overlooking Hoy Sound. His poem "Hamnavoe" is set in the town, and is in part a memorial to his father John, a local postman. Stromness is referred to in the title of Sir Peter Maxwell Davies's popular piano piece "Farewell to Stromness", a piano interlude from The Yellow Cake Revue, which was written to protest at plans to open a uranium mine in the area. (The title refers to yellowcake, the powder produced in an early stage of the processing of uranium ore.) The Revue was first performed by the composer at the Stromness Hotel on 21 June 1980, as part of the St Magnus Festival; plans for the uranium mine was cancelled later that year. Stromness is also the title of a 2009 novel by Herbert Wetterauer. Stromness presents to the Atlantic a range of cliffs between 100 and 500 ft high, and to Hoy Sound a band of fertile lowlands. The rocks possess great geological interest, and were made well known by the publication of the evangelical geologist Hugh Miller, The Footprints of the Creator or The Asterolepsis of Stromness (1850). ^ "Parish Names" Orkneyjar. Retrieved 27 Dec 2010. ^ Iain Mac an Tàilleir. "Placenames K-O & P-Z" (PDF). Pàrlamaid na h-Alba. Retrieved 23 July 2007. ^ A dinner service Captain Cook used on his final voyage is on view at Skaill House, Bay of Skaill, home of 19c. Skara Brae excavator William Watt, a mansion built by George Graham, Bishop of Orkney 1615-1638, on the site of a farmstead dated to the Norse period. ^ "Hamnavoe by George Mackay Brown". Poetry Archive. Retrieved 23 June 2012. Wikimedia Commons has media related to Stromness. Wikivoyage has a travel guide for Stromness. Ballantine's Midnight Cup at Stromness Golf Club, stv feature, 19 June 2007. This page was last edited on 21 April 2019, at 17:27 (UTC).